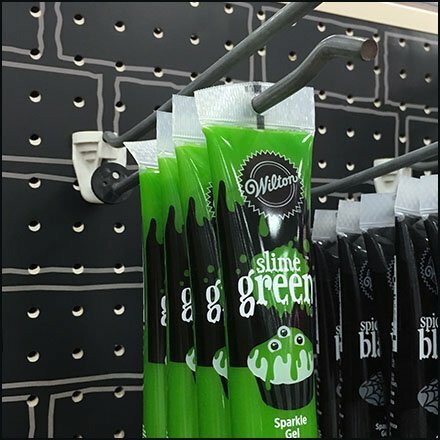 Slim and almost tube-like in shape and orientation, this is nevertheless Green Slime Pouch Merchandising By Hook. Again the fixture hero is a 2-Piece Straight-Entry Scan Hook. Packaging is again printed and presented in the “use this way” orientation. Consider Green Slime vs Decorating Icing in the paired posts by Wilton. Seen at Target, Rockaway Townsquare Mall, Rockaway NJ.